My rating: 8/10. Affordable chronograph watch. Quartz powered timepiece. Hello, today I’m doing a Fossil FS4813 review. 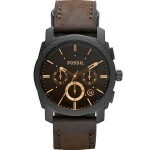 Fossil are a brand that are well known for their quality affordable timepieces. 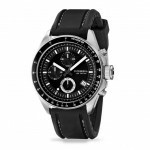 This is one of their top selling quartz watches at the moment. It has an eye catching round black dial with gold coloured Roman numeral hour markers. 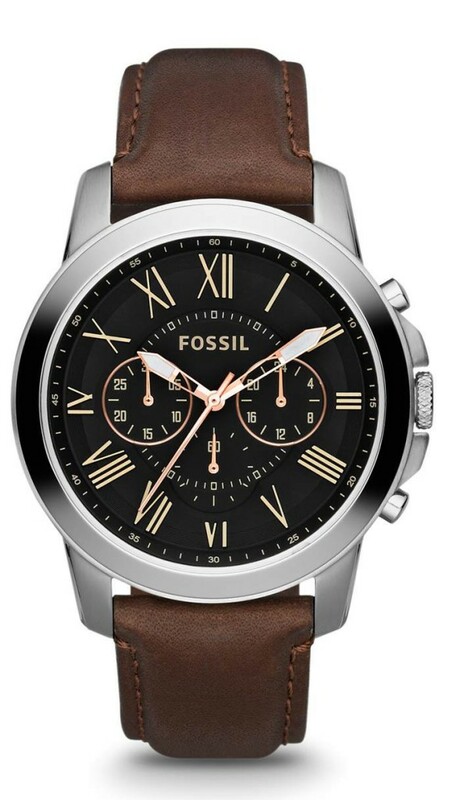 I hope you enjoy this Fossil FS4813 review below. This Fossil watch has a very smart looking chronograph display that features these bold white hands to make telling the time very easy. The dial also features these large Roman numeral style hour markers. The hands are coated in lume for better visibility in dim lit conditions. The casing of this Fossil watch is made of stainless steel, it features the crown at the 3 o’clock position with chronograph pushers positioned either side of it. Protecting the dial of the watch is a mineral crystal glass. This type of glass is specially hardened to make it extra resistant to scratches and knocks. It’s commonly found on many watches in this price range, and overall something I’m quite happy with. Powering the watch is a quality Japanese quartz movement. These are commonly found on many watches in this sort of price range. They’re popular for their reliability and accurate timekeeping. The casing diameter of this Fossil watch measures approximately 44mm in diameter and has a thickness of 12mm. All in all a decent size for those of you looking for a larger statement watch. The strap is made of a soft genuine leather in a brown colour. It fastens with a traditional buckle style clasp and has a width of approximately 22mm. This watch has a 50m water resistance rating. A 50m or 5 bar rating makes this watch suitable for swimming, white water rafting, non-snorkeling water related work, and fishing. Band: Genuine leather strap, standard length, 22mm width, buckle style clasp. Case: Stainless steel casing, sizing diameter: 44mm and thickness: 12mm. Water Resistant: A water resistance of up to 50m / 5 bar. Due to its larger 44mm casing this watch may not be suitable for people with smaller wrists. 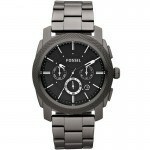 Overall, it’s another great timepiece from Fossil. Well built and in my opinion defintely good value for money. After looking into the watch design, quality, features, and pricing this watch received a 8/10 from us at The Watch Blog. Hope you enjoyed this Fossil FS4813 review. Find more watch reviews below.